The Journey To Excellence report and worksheet can now be produced for Scout Troops. To collect the necessary information for these reports, new parameters were added to the Training Course and Leadership Position tables. A new JTE tab was added to the Events maintenance page, where you can indicate the JTE requirements that were satisfied at each event. The Journey To Excellence Report shows the score on each objective plus an overall score. The Journey To Excellence Worksheet provides the underlying detail for each objective. Dress Codes may now be defined and assigned to each event. You may now track each of the five hikes needed for Hiking merit badge. Four new fonts are now available in the Site Appearance page. 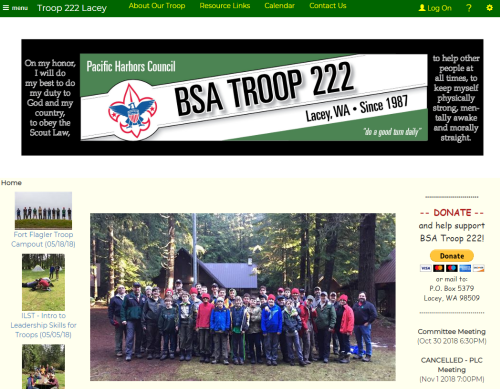 Troop 222 of Lacey, Washington! Troop 222 shows us what an interesting font selection and snazzy banner image can do to create a distinctive site. We like how they added a PayPal "Donate" button as their first announcement, so that it always appears at the top of the Announcements and Upcoming Events widget on their Home page. Lots of photos going back 2 1/2 years show off this troop's energy!